The Life of Adam and Eve is an expansion of the creation and fall narrative. It appears in two forms, a “Life” of Adam and an “apocalypse” of Adam. Both were likely written in Hebrew and translated into Greek and Latin. There are parallels to other pseudepigrapha (2 Enoch) and rabbinic traditions as well as Josephus (Antiquities 1.2.3). It is possible the book influenced the story told in Josephus or vice-versa, but it is almost impossible to who used whom. A range of dates from 100 B.C. to A.D. 200 is likely. The key evidence for the provenance of the book is the use of the mythical Lake of Acheron in 37:3. This is thought to be an indication the book came from Alexandria, where the Greek ideas might have been more current. OTP has printed the two works side-by-side so parallels may be studied. The first eight chapters of the Life of Adam and Eve begin just after Adam and Eve are expelled from the garden. They have nothing to eat except what the animals have. They go nine days without eating and realize their need to repent. Adam fasts for forty days in repentance, Eve stands on a rock in the Tigris River up to her neck in silence for thirty-seven days. Adam does the same in the Jordan for forty days. When Adam does this all the living creatures surround him and the Jordan stands still. Eighteen days later Satan comes to Even while she is in the river as an angel of light (ch. 9-11). He commands Eve out of the water and promises to take her someplace to eat. When Adam sees his wife with the Devil (again) he calls out to her and asks her what has happened to her repentance. Adam asks the Lord to remove his opponent far from him, and the devil immediately disappears. Adam “persisted” with his penitence in the Jordan. Chapters 18-24 deal with the children of Adam and Eve. As she is giving birth, she is in terrible pain and cries out to God. Adam thinks she is struggling with the devil again and he prays for her. Twelve angels and “two excellencies” appear and stand on her right and left while she gives birth to Cain, who is described as “lustrous” at birth. When Abel is born, Eve has a vision of Cain’s murder. The parents resolve to keep the children far apart, which is why one was a shepherd and the other a farmer. Adam tells his son Seth the story of how he was returned to Paradise in a vision (ch. 25-29). He is carried to heaven in a fiery chariot where he worships the Lord. Michael takes him by the hand and brings him to Paradise where he touches the waters of Paradise with a rod and freezes them. Adam’s “testament” appears in Chapters 30-36. He gathers his family around him to give them a final charge. As in other testament literature, Adam gives a recount of his life, especially of the fall. Two angels were appointed to watch over them in the garden, but they ascended to heaven at the appointed hour of worship. It is at this time that Eve ate the forbidden fruit and cause God to be angry with them. God promises to bring upon their bodies seventy plagues and they will be racked with severe pains from the top of their heads to the nails of their feet. When Adam is in pain Eve asks for the pain to be transferred to her since it was she who sinned. 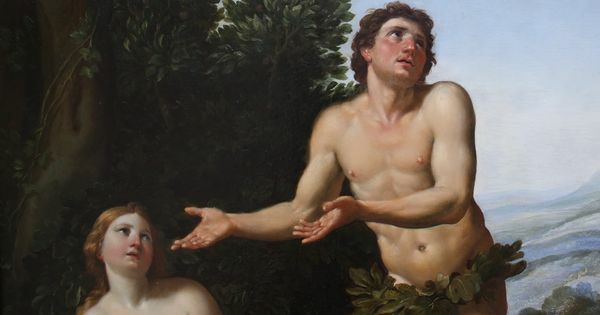 Adam requests Seth and Eve go to Paradise and mourn for him, hoping that the Lord will allow them to take a little oil of life to anoint him with and relieve his pains. That Eve is responsible for sin is found in several places in the pseudepigrapha and is quite the opposite of Romans 5 and 1 Corinthians 15 where Adam and Adam alone is blamed for sin. In the two places where Paul mentions Eve, however, she is not placed in a favorable light. In 2 Cor. 11:3 Eve is deceived by the devil’s cunning. In the very difficult passage in 2 Tim 2:13-15 Eve was deceived and became a sinner. The connection with “saved through childbirth” in 2:15 could be a reflection of Eve requesting Adam’s pain in this pseudepigraphal account. It is through her pain in childbirth that Eve atones for her part in the fall. Chapters 37-44 is an odd sequence which occurs on the way to collect the oil of life. When a serpent attacks and bites Seth, Eve rebukes it because it dared to attack the image of God. The serpent responds to Eve in a human voice – the malice was directed at Eve because she ate the fruit of the tree. Seth rebukes the serpent and commands it to “stand back from the image of God.” The serpent obeys and they continue to paradise. They weep and lament, begging for the oil of life, but Michael appears and refuses to give it to them. No one may have it until the last days, he says. There is nothing left for Adam but to die. They do gather some herbs on the way home, probably to ease his pain. Seth returns to Adam and reports the attack to him. He blames Eve: all their children are affected by the “bite” of the serpent. The tablets do in fact endure (51:3-9). They are seen by many but read by no one after the flood until the time of Solomon. The angel of the Lord appears to him and tells him how to read these stones. On these stones are the words of Enoch, the seventh from Adam, “behold the Lord will come in his holiness to pronounce judgment on all” (cf. Jude 14-16). Never mind I re read the first part. Why was this written? Like who wrote it and what were they hoping to give to the world by writing it? And so either way, if Josephus made this up or recreated it, why would he include it in his writings? I am not sure we can know the why, although it attempt to fill in the blanks in the biblical story, maybe to shift blame from Adam to Eve, Cain, etc. The issue is whether Josephus knew the book, or the traditions that ended up in this book. The problem is all the manuscripts we know are very late.